Munshi and 42 other artists were participating in the Kochi-Muziris Biennale at Uru Art Harbour in Kochi. Kashmir reverberated from the port state of India, Kerala, twice last week. The most read news was when the host football team humiliated the Real Kashmir FC that had flown to the Kozhikode for playing an I-League match. The second was quite earlier when the prominent artist Veer Munshi curated a 12-hour performance showing Kashmir architecture that exhibited the prevailing situation. 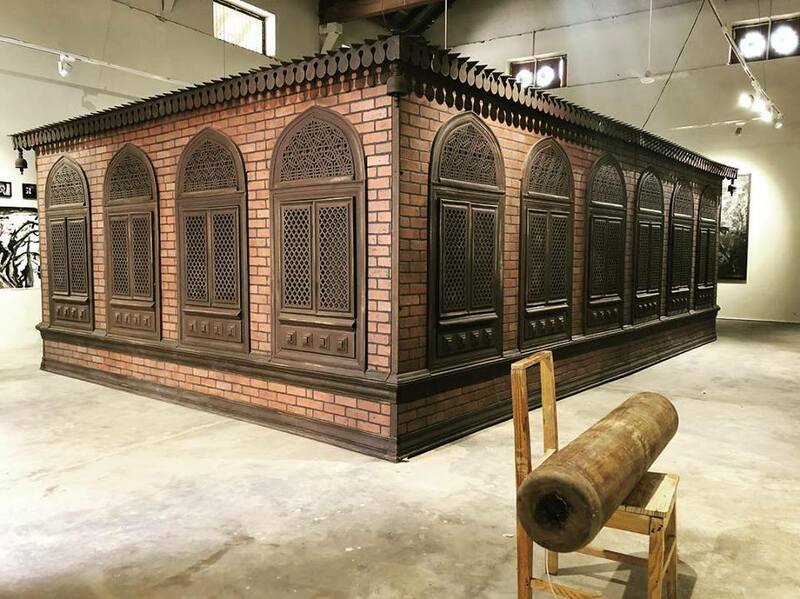 The Srinagar Biennale envisaged recreation of a Sufi dargah for this travelling art project. “The shrine itself is marginalised and here I will use the space, both inside and out, to showcase the works of 14 artists who were either born in the conflict or have been affected by it,” Munshi has told reporters. A “middle space”, it explores how the “boundaries between ideas shift constantly and get challenged endlessly”. The dargah was recreated at the centre of the hall. On the walls of the hall where the artworks of Kashmiri artists mounted on it. But at the entry to this space, there were two artists, man and a woman, frisking everybody who would get in. The idea was to offer the visitors an idea of the situation in which Kashmir has been living in. “Surveillance..a practice of social intervention, becomes a channel in inducing violence trauma, hardship and socioeconomic suffering which causes individuals to adjust their behaviour and routine to save themselves from harassment,” Munshi wrote on his Facebook. The lady who was frisking was Hina Arif, a master in applied art from Jamia Millia Islamia Delhi, and Saquib Bhatt. A police officer who was mock-frisked threatened the artists that they could be arrested for what she did. Artists told the newspaper that mock frisking was an idea to show “how ‘normalised’ some people and cultures are with respect to surveillance.” The duo, the newspaper said, was whimsical “about whom to let in and who not, rejecting some people without assigning any reason, a normal everyday event at security checkpoints in conflict-ridden Kashmir. “Occasionally there was resistance,” the newspaper said. A Rench visitor told the media that he has never witnessed the frisking in his life.